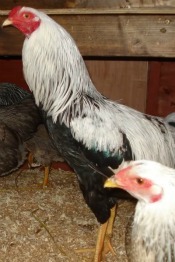 The Kraienkoppe chicken breed is a sporty ornamental breed that comes from Germany. Size: Standard Male: 6 Ibs. Standard Female: 4 Ibs. Comb, Wattles & Earlobes: They have a small walnut comb, as well as small wattles and earlobes. They are all bright red. Color: They have a horn beak and reddish bay eyes with yellow shanks and toes. Special Qualities: A good looking ornamental breed that lays decent eggs. 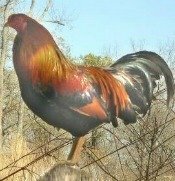 This breed is a sporty looking bird for an ornamental breed, but the roosters especially are very beautiful with their lustrous plumage. The breed was developed along the border of Germany and the Netherlands. The breed was formed by crossing Malays with Leghorns (most likely of the silver duckwing or brown varieties). The name listed is the German name for the bird, but the breed is referred to as the Twentse on the Dutch side of the border. The breed is best known as an ornamental layer and produces a decent amount of medium-size off-white eggs. They also lay pretty well in cold weather. The hens do tend to go broody. They are active birds and excellent foragers and do well in free range conditions, but they will tolerate confinement. The breed is a fairly new arrival in North America and have yet to be recognized by the APA. There is a bantam type in Europe, but not in North America.